Chef de Cuisine Chad Shrewsbury of Six Peaks Grille at the Resort at Squaw Creek in Olympic Valley, California focuses on steaks, sustainable, biodynamic produce, and seafood, and the restaurant's wall of windows overlooking the mountains provide the perfect background for his creative culinary style. 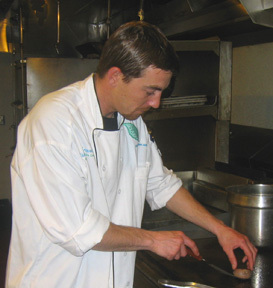 To write that Chef de Cuisine Chad Shrewsbury of the Six Peaks Grille at the Resort at Squaw Creek is a foodie would be an understatement. 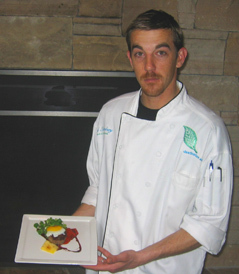 I had the pleasure of meeting with Chef Chad Shrewsbury in late February 2012 after dining at the Six Peaks Grille, and learned that the Walnut Creek, California native has been cooking since the age of 13, and at age 29, has been cooking for more than half his life. Dedicated and passionate, he cannot imagine doing anything else. 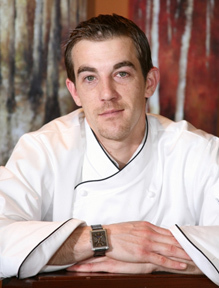 Inspired by his father who worked as a front of the house manager at restaurants and hotels, young Chad began working in kitchens as a prep cook, and honed his culinary career by watching great professional chefs and then adapting their ideas and culinary styles and making them his own. Self-taught, he said that his success has come from pushing himself to be the best he can. After working at other top-notch restaurants, he joined the Resort at Squaw Creek five years ago, and worked his way up the culinary ladder to his present position of Chef de Cuisine, a position where he clearly shines. He believes in mentoring and motivating his team by encouraging them and giving them free-range without passing set boundaries, which makes him a better chef, and makes his team better as well. His focus for the restaurant is sustainability, using biodynamic, organic, and as many local ingredients as he can to build the spirit of community. Every chef has his or her favorite ingredient, and Chef Chad Shrewsbury's favorite ingredient is foie gras, however on July 1, 2012, a law will go into effect in the state of California that will prohibit the use of foie gras. Not a problem, though, he said that his second favorite ingredient is scallops, "I am a seafood guy." In his free time, he likes to fly-fish in the area, actually anywhere he can, and enjoys going to Utah, where there is great fishing and it is so relaxing. 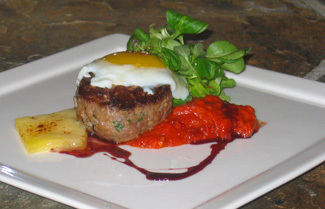 A foodie at heart, he also likes to go to Las Vegas for the culinary scene and check out the new restaurants. 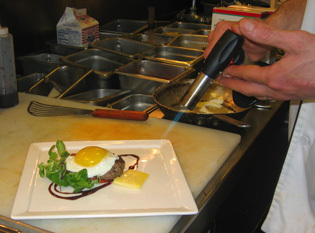 Chef de Cuisine Chad Shrewsbury graciously shares his recipe for Crispy Lamb Sausage with Toasted Fontina Cheese, Watercress, Egg Yolk, and Romesco Sauce which is on his Spring Summer 2012 Menu, to provide you with a delectable taste of Six Peaks Grille at the Resort at Squaw Creek. Method: Mix all ingredients together until combined. Form sausage into patties and cook sausage until crispy. Method: Snap the stems from the Nyora peppers. Shake out and discard seeds. Put the Nyora peppers in a heatproof bowl and cover with 2 cups of boiling water. Set a small plate on top to keep the peppers submerged and let sit until softened, about 20 minutes. Discard the soaking liquid. Set the peppers aside. Method to Roast the Bell Peppers: On a gas stove, hold the peppers with tongs over an open flame turning them until they are blackened uniformly, about 3 to 5 minutes. (Alternatively, put the peppers on a baking sheet and roast in the oven at 450° F until the skins become brown and loosen, about 30 minutes.) Transfer the peppers to a bowl and cover tightly with plastic wrap for 15 minutes, allowing them to steam and cool slightly. Peel the skins from the peppers, remove the seeds, and set the peppers aside. Heat 2 tablespoons of the olive oil in a small skillet over medium heat, and then add the hazelnuts and cook, shaking the pan a few times, until lightly browned, about 4 minutes. Drain the hazelnuts and let cool slightly. Remove as much paper coating on the nuts as possible. Discard the oil. Method for the Romesco Sauce: Combine the Nyoras, roasted bell peppers, hazelnuts, breadcrumbs, garlic, tomatoes, sherry vinegar, and a half cup of olive oil in the bowl of a food processor. Season generously with salt and pepper and pulse until completely puréed. Transfer to a small plastic container, cover, and refrigerate until needed. The Romesco Sauce can be made a day ahead and kept covered in the refrigerator. Presentation: Spoon the Romesco sauce into the middle of a plate, place the sausage on top of the sauce, position the watercress alongside the sausage, top the sausage with a fried egg cooked to just set (sunny side up), place a piece of Fontina cheese on the plate, and lightly toast the cheese with a kitchen torch. Bon Appétit! 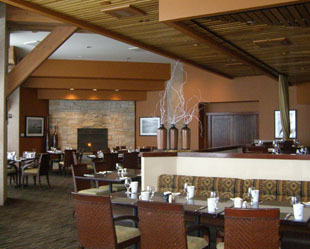 Read about Six Peaks Grille in the Restaurants and Hotels and Resorts sections. Read about the Resort at Squaw Creek in the Destinations, Hotels and Resorts, Restaurants, Spas, and Adventures sections.